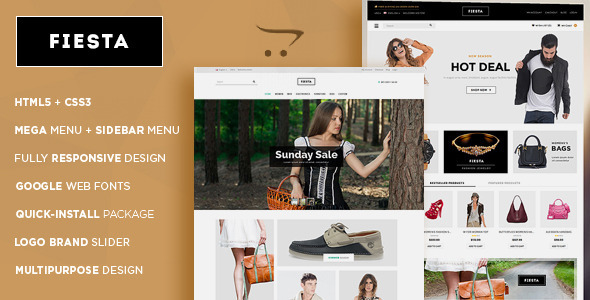 Handbag OpenCart Theme / Handbag OpenCart Template: Fiesta is a responsive OpenCart template designed for all kinds of stores, shops and businesses selling bags, handbags, travel bags, and other related products. It is packed with the best-in-class features as well as a suite of powerful extension that is offered free. 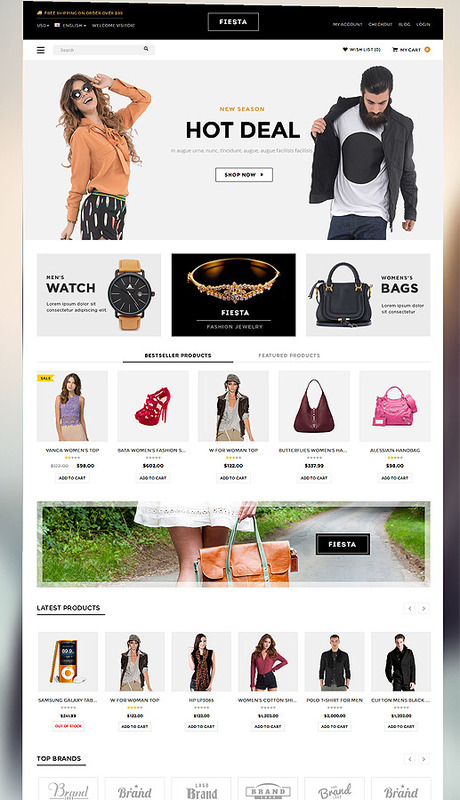 This is speed and SEO-optimized Handbag OpenCart template. Easy to customize OpenCart template. Responsive Design with HTML5 + CSS3 : Go with the times! Your store will be adjusted in smart phones, tablets, desktops & many new devices. Unlimited colors: Control almost every color of your theme from powerful admin panel. Integrated Google Fonts: You can easily change the fonts for buttons, titles and page heading. Slideshow: You can now have a slideshow for your promotions on homepage. Drop-down shopping cart: In header shopping cart will be shown as a drop down on mouseover. Product detail page: Theme will show tabbed product data, reviews on product page. More view images: Scroller Thumbnail images in product page. Integration with Cloud Zoom : This option selection will allow you to enlarge product images. Brand logo slider: Get ready with brands logo slider in footer. Theme Structure: Optimized, well-structured and commented CSS , HTML. What’s Included: Theme PSD files, .pdf & .html documentation files for theme install is included. Social bookmarks: Social bookmark block is added in footer. You can add your social links fromadmin panel. Slider for Related Products : Now you can show as much related products as you want. Custom Tab: Custom tab for product page, ready to display product details like info about shipping, returns, sales, etc. Custom block for drop-down menu: Now you can display your custom content as a drop-down block in navigation. HOME link in menu: You can now add home page button in the main navigation menu. Product label: Mark your products with eye-catching labels. Sale label on products in categories and on other product listings (editable from admin panel). Browser Compatibility: (IE9+, Firefox, Opera, Safari, Chrome). Support and updates: We provide fanatic support & keep our themes up to date.